Discussion of facts versus fiction when buying garage floor tiles. Do you need to order a whole tile as a sample to get a good feel for the tile? Absolutely no. We send out a small piece of the tile and as soon as you put it into your hand you can tell that our tiles are head and shoulders above the other popular tiles that send you a full a tile as a sample. If you’re using cheap recycled materials and the tiles cost you only a dollar to make or import from China then yea you can send out free full tiles. Our tiles are very costly to make cause of the high quality PVC we use plus they weight 4.5 lbs each as compared to a few ounces of a typical Polypropylene tile. So shipping our tile is much more expensive. Our tiles are very competitively priced for what you are getting. Meaning are margins are very tight as compared to tiles that cost a dollar to manufacture and sell for not much less than our 100% solid PVC tiles. So don’t get fooled or impressed by anyone just because they sent you a full tile. Instead concentrate on what it is you’re getting as a tile. Is it hollow, is it solid, is it PVC or Polypropylene, does the tile have full perimeter locking tabs or just a few Peg and Loop connectors on each side. Big difference! Peg & Loop connections stink. They make popping noises as your car drives over them, they break off as you install them, they break off if your floor is the slightest bit un-level(and what floor is 100% level? ), they stretch and start to split apart creating large unsightly seams that get filled with all sorts of crud that is next to impossible to clean out. So instead of worrying about the sample you get focus on the quality difference and figure out which tile is going to look new 5, 10 or 20 years from the day you install them. It won’t be a hollow polypropylene tile with Peg & Loop connections. There seems to be as much misinformation about garage tiles as there are different types of tiles. We’ll go over a couple facts here and let you decide on what your money is best spent on. 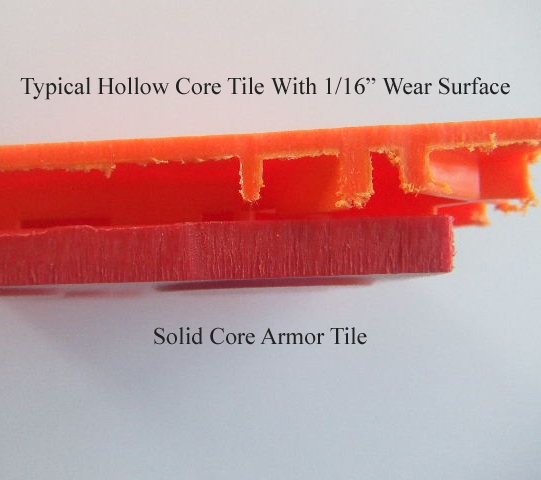 First lets talk about the two main types of tiles, hollow core tiles and solid core tiles. Hollow core are exactly what they sound like. They have a thin wear surface and are completely hollow underneath versus a solid tile that has no hollow spaces. This image clearly shows the difference. As you can see the top tile is hollow while the bottom tile is completely solid. It’s easy to figure out which is the stronger tile and which one will last longer. Next is the different types of material the tiles are made from. First thing we would strongly suggest is you find out where the tiles you are considering to buy are made. Lots of tiles on the market are coming from China. They look similar to our tiles but are very different. First you have no idea what they are made of and what type of filler products are in them. Think Chinese drywall. Our Garage Tiles are made right here in the USA . Plus we only use materials originating in the USA. So beware of tiles that are made here but use Chinese materials. So leaving out the Chinese factor, the two main materials used are Polypropylene and PVC. Polypropylene tiles are basically recycled soda and water bottles. Very cheap material otherwise known as ABS plastic. When home builders want to cut corners they have their plumbers install ABS plastic instead of PVC. PVC is a far superior material and correspondingly more expensive. So if you are comparing PVC tiles to Polypropylene tiles it’s the proverbial apples to oranges comparison. You can double that comparison when comparing hollow polypropylene tiles to solid PVC tiles to an apples and crackers comparison. Another myth is that if you drive smaller vehicles and only go straight in and out of your garage you don’t need a quality tile. We say that’s nonsense. In anything in life you buy, you get what you pay for. Those polypropylene tiles you think you saved money on will end up costing you more than you think and not just in dollars but in dissatisfaction down the road. They damage easily, they’re brittle and crack easily, they expand and contract more to the point they pull apart or buckle, they make loud click clack noises when you walk on them. All the above have nothing to do with the vehicle you drive or whether you drive straight or zig zag. Oh and by the way who drives perfectly straight in and out of anything. As soon as you turn your wheel the slightest bit you are stressing and stretching those Peg & Loop connections. We used to sell hollow polypropylene tiles but they were so problematic we stopped. If you are doing a commercial or industrial application don’t even think about polypropylene tiles! Even though those types of tiles are heavily marketed they are inferior in quality and prone to failures. In sum it makes no difference in the car you drive or in what direction you drive, you want to buy a solid quality tile that will be worry free and indestructible. More facts and fiction on garage tiles in a future post.